Have a cold one, relax and share some Nats stats with the locals at the best Washington Nationals hangout. 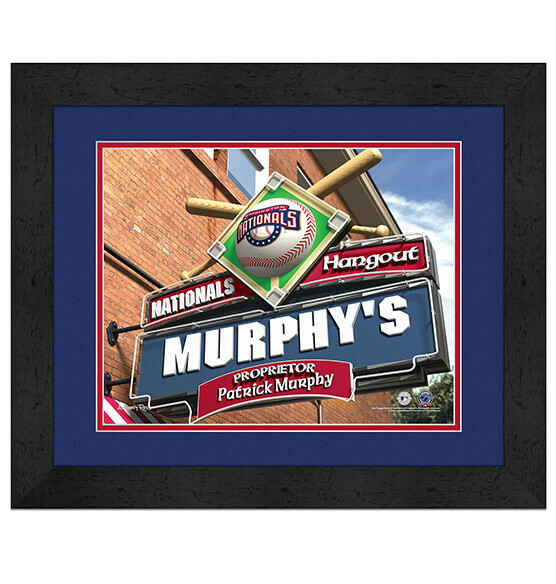 Our Washington Nationals Personalized MLB Pub Sign decor is a premium sports decor addition to your Nats fan zone. Just let us know the name you want to add on the marquee on the front of this brownstone — this "sign of a sign" will be the envy of all your fellow Nationals fans. The quality black frame and crisp made-to-order print that features team colors and the official team logo make this a Nationals' fan-favorite in our book. This piece arrives ready to hang with an attached sawtooth hanger.